Eat local, save money, and support your local economy--how the switch to a local, seasonal diet changed my life. 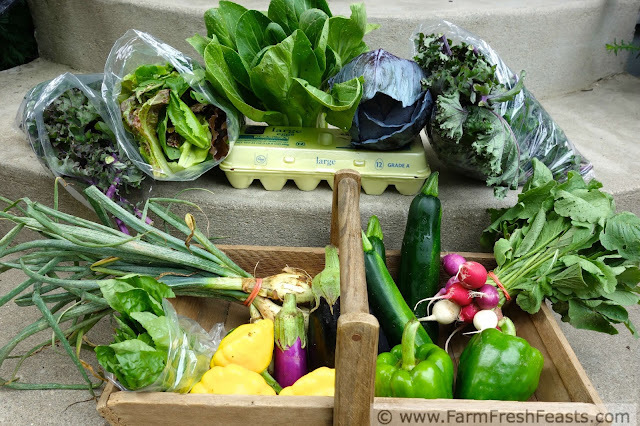 This is a typical early summer farm share box. It's got plenty of leafy greens along with some herbs, onions, squash, eggplant, peppers and radishes. 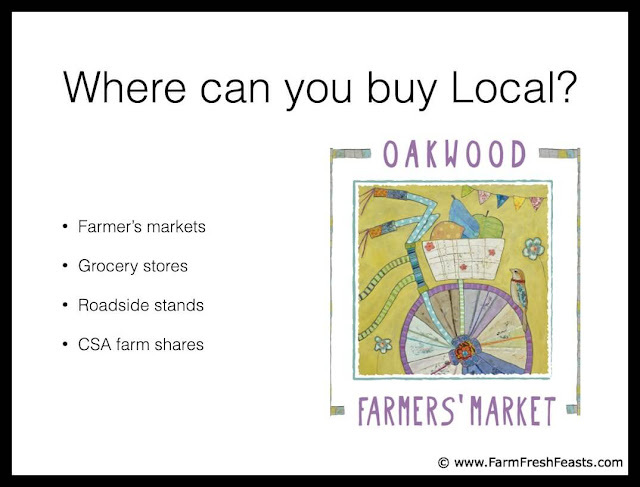 So you want to Eat Local more often this year? Me, too. I'm glad you're here. I think eating locally is good for your body, your family, our environment and our community. Plus, the food just tastes good. For over a decade I've been deliberately seeking out locally grown fruits and vegetables, locally produced sweeteners, and locally sourced protein. I've moved from the East Coast to the Midwest while keeping up with my Buy Local habits. I suspect these tips are transferable, so I've decided to break from the usual 'how to use the farm share produce' recipe type posts for a series on how to add more local to your life. 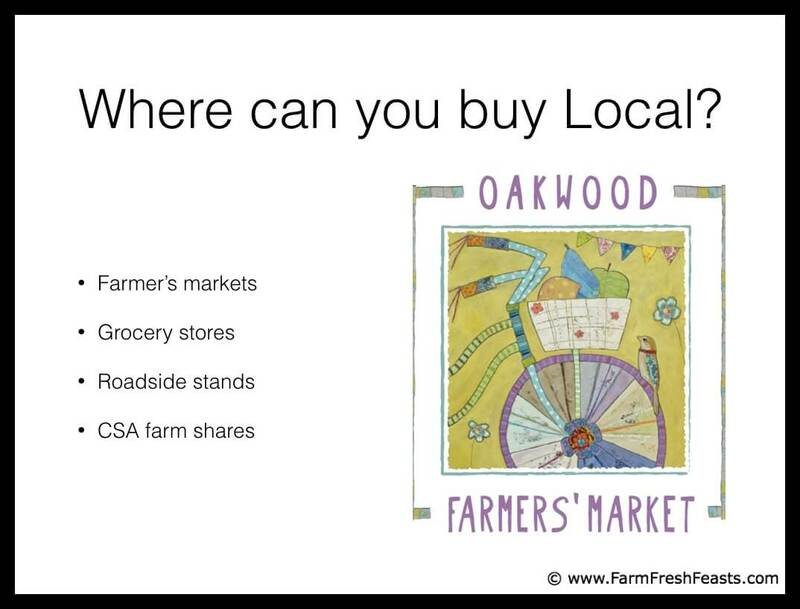 Please feel free to share with someone thinking about eating more local this year. I know we can all use support to make our good intentions into actions. This series evolved from a talk I gave at my local community center entitled Eat Local, Save Money, and Support Your Local Economy. Over the years I've picked up a bunch of tricks to make successful local food choices, and I wanted to share some. The start of a new year is often a motivating time for many people, so if I can help nudge your local leanings into some practical action I'd be delighted. Over the series we'll cover why sourcing food locally is good for your economy, where you can find local foods, and how to shop more mindfully. I'll share my philosophy on menu planning--when I do it, when I wing it. I will explain vegetable triage, and share some tips on reducing food waste. I'll give you some tips for preserving produce while it's abundant--without needing fancy equipment. Feel free to poke around the website--there's a lot of nuggets of wisdom in here along with some pizza. To help eaters like me, I've got my recipe index broken into produce type--from Acorn Squash to Zucchini--with a variety of recipes for a variety of eaters. I'd like to start off with my biggest surprise--the WHY of Eating Local. Why are YOU interested in eating local? For me, it began as a way to increase the amount of vegetables and fruits our family was eating while supporting farmers who are respectful and kind to the land in the region we live. The human and environmental impacts were pretty much all I thought about. Now, though, the economic impact of my purchases on my community are my bigger motivation. This is for two reasons. First, every dollar is a vote for what matters to you. Second, everybody eats. If I can combine my voting (dollars) with something I've already got to do (buy food), I see that as a winning multitask. As the chart above shows, 48 cents out of every dollar you spend locally is recirculated in your community. This multiplier effect ripples throughout the region. 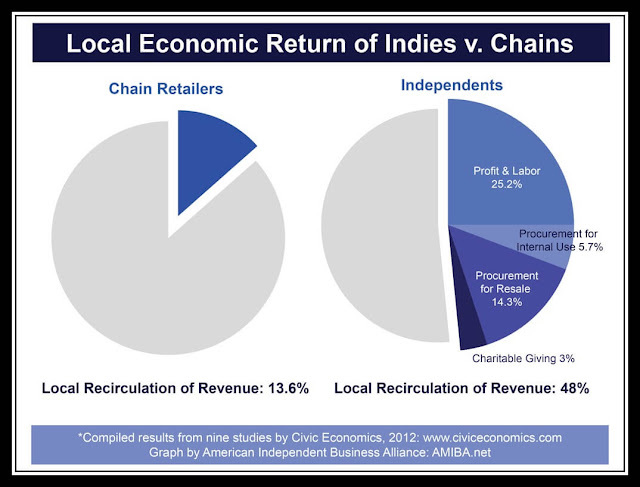 When you buy a box of strawberries or a loaf of bread at the farmer's market, or eat at a local independent restaurant, you are contributing to your neighbors, to your PTO, to the emergency services of your town as your dollars are recirculated by local business owners. You are enriching your community just by buying dinner. That's pretty empowering. 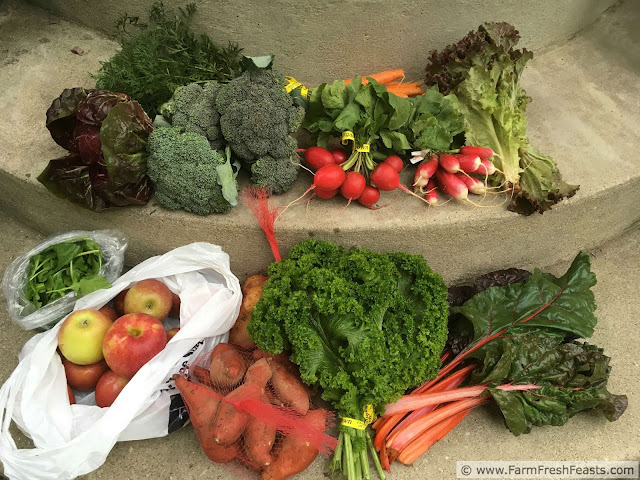 This is a typical Fall farm share. It's got plenty of leafy greens, cool weather crops like broccoli and radishes, as well as apples, potatoes, and sweet potatoes. One of my favorite things about eating seasonally is anticipating all the terrific flavors. You know how good tomatoes taste in the summer? And strawberries, when you go to a pick your own place? Celery actually tastes amazing when it's grown for flavor, too. Local vegetables just taste better--because they are ripe when harvested, not chosen because they can be transported over multiple states and step off the truck looking fresh and enticing. Because I eat locally, don't eat pale mealy tomatoes in January or pretty-but-bland strawberries in October. Life's too short to eat tasteless food. So I don't. I eat with the seasons and we eat well. Now that you want to eat local food, how do you find it? 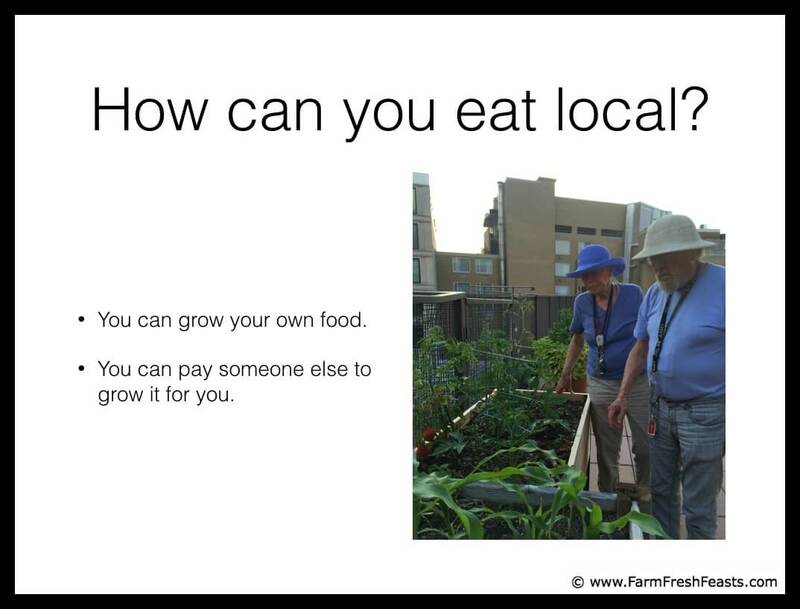 If you want to eat locally, you can grow your own food or you can pay someone else to do it. It's as simple as that. I mostly do the latter, although I did learn to garden from my folks, who are shown above at their old place smack in the heart of Washington DC. [That's not their raised bed, though, that belongs to a neighbor.] While I can grow a year's supply of garlic or pickling cucumbers in my backyard, I am not a production farmer and don't have enough space or know-how to DIY. Instead, I pay people to grow food for me. I do this in three ways. First, I participate in a Community Supported Agriculture, or CSA, farm share. Second, I shop at farmer's markets. Third, I look for locally sourced ingredients at the grocery store. For the next post in the series, I'll dive a little deeper into this topic in my Where to Find the Best Local Foods post. Action step! If I've gotten you fired up about eating locally, but you're looking out at a snowy winter landscape wondering how long it will be until you've got fresh local food available, don't despair. Here's one small thing you can do now to eat more local this year--look for locally sourced maple syrup, locally produced honey, or locally grown eggs at the grocery store or farmer's market. Stay tuned for the next part in the series, Where to Find the Best Local Foods! Great post. I wish I had attended your library session. Also you just made me feel much better about the more expensive but locally sourced cheese I purchased this morning at Whole Foods. Thank you.